There is something very special about the game of Double Exposure Blackjack, and when you find out what that is we are more than convinced that you are going to want to play this game more and more at casinos offering it to their players! 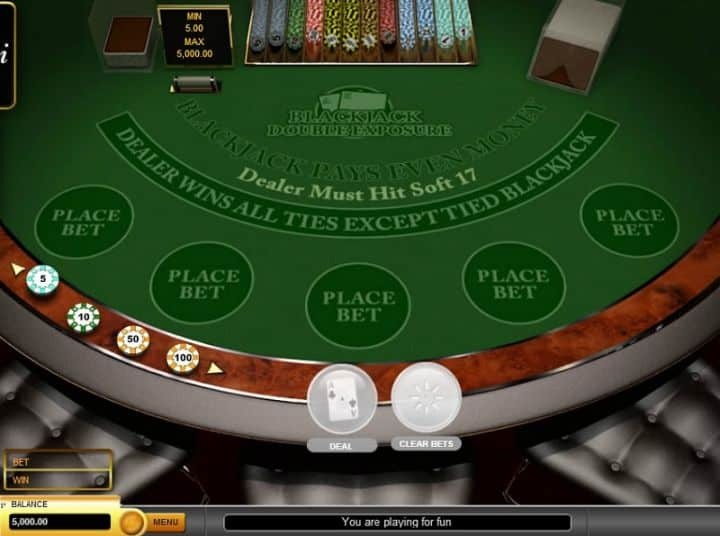 You will find out in the following section of this review of that popular casino card game how to stake each hand you play off, however when you have selected a stake and then have dealt on the deal button the Dealer is then going to be dealing out to you two initial cards which as usual are dealt out to you facing upwards. However, the Dealer will then do something very unusual, and that is to deal his two initial cards both facing upwards too! That means each and every single time you do choose to play the Double Exposure Blackjack game online you will always then know what the value of the Dealers hand is! You are probably now highly interested in playing this card game, for due to the simple fact you are going to know just what hand the Dealer has at the very same moment in time you are dealt out your hand you can then base all of your betting decisions on what you know the Dealers hand is worth and will not have to take a guess at his hands value which you do on other games. You have a range of different chip values that you can pick and choose from and each click of your mouse will place one more chip onto the betting box on the chip value you have chosen. The very minimum chip value you can play this Blackjack game for is just 1.00 so it is a very low stake game if you do want to play for low stake amounts and low chip values. One way that we think you are going to be best off playing Double Exposure Blackjack initially is via the free play option above, for by doing so you can then very quickly get to grips with all of the available betting options you can play this game for. Keep in mind however that as you can always see just what playing cards and the value of the hand the Dealer is holding then this game does call for a slightly different perfect strategy to be put into play, so do play it for free until you have full got to grips with the way this game plays and pays as you can then switch over to the real money version of the game at a later date once you have fully mastered its very unique playing structure!